Behind some outbuildings at the Old Forge is an oil tank and an expanse of gravel. For three long years, I weeded that gravel until, a couple of years ago, I (finally) realised I was being stupid. Instead of weeding, why not fill it with plants? Drought resistant, hardy plants of course but there would be another stipulation. The owners hadn’t asked me to do it, they didn’t know I was going to do it – I could hardly spend their money on planting up my own little project. So, I would only use plants I already had, sow seeds I could collect and hopefully, please them with the result. This is the oil tank area a couple of months ago with new growth appearing. 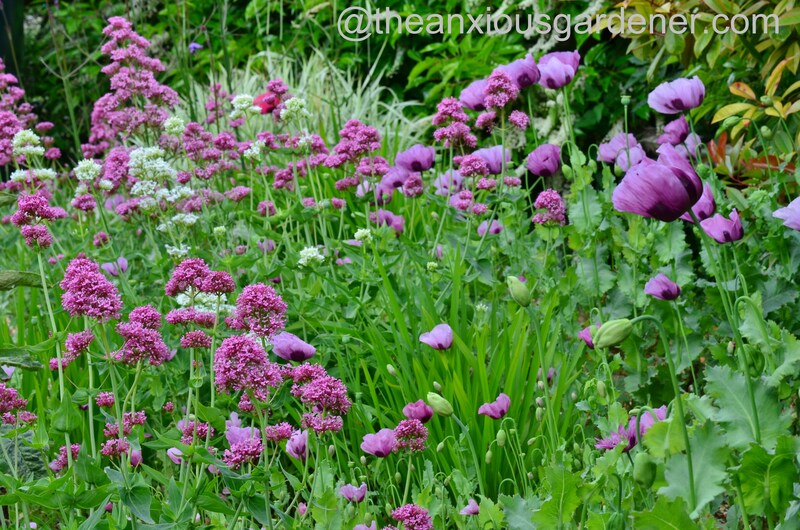 During the summer of 2013, I shook opium poppy seed-heads about, as well as the seeds of Verbascum olympicum. 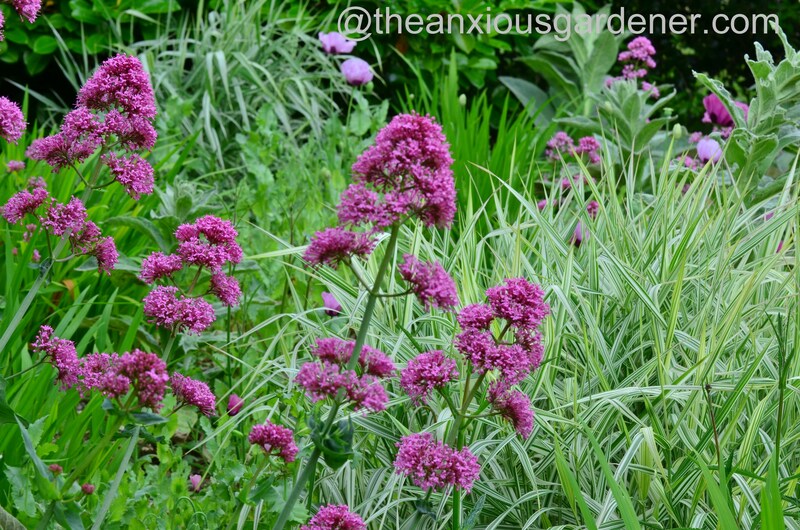 I added some spindly valerian plants (Centranthus ruber) – salvaged from someone’s compost heap. And they’re flourishing in these hot, dry conditions. I planted several clumps of a variegated grass. I’m afraid I don’t know the variety – it too was unloved in another garden. Crocosmia went into the mix (there is always spare crocosmia in any garden I’ve ever worked in). They’ll flower later. Verbena bonariensis is here too (from an almost infinite supply of seedlings at the Priory). They have just started flowering. I left a wide path so that the oil-delivery man can get to the tank – with his large, sinuous hose. The verbascum has been the only failure and that’s a shame; the towering yellow spikes would’ve looked grand. The caterpillars of the Mullein moth have shredded my lovely plants. I’ve picked off dozens but, as I’m only at the Old Forge once a week, I haven’t been able to clear them all. Look what they’ve done to my should-be-stately plants. I shan’t be using verbascum again. All the plants here must be tough and more-or-less problem free. 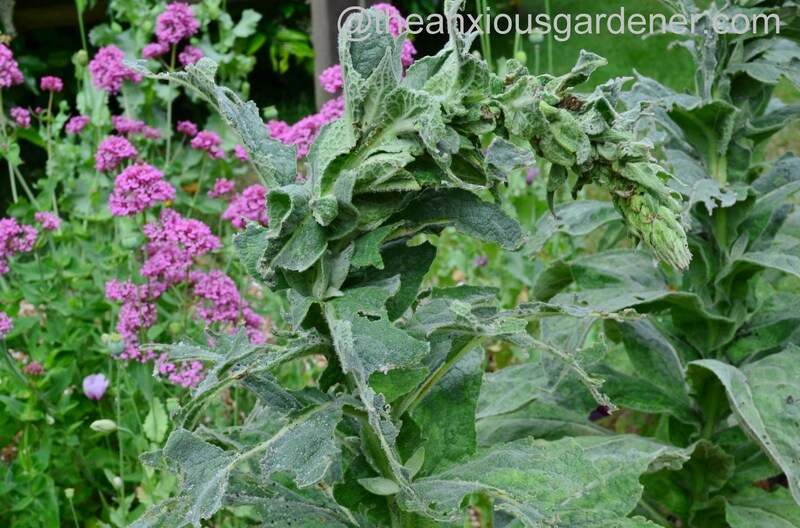 Sorry verbascum – you just don’t make the grade. The amount of insect interest in my ‘new garden’ has been fantastic. 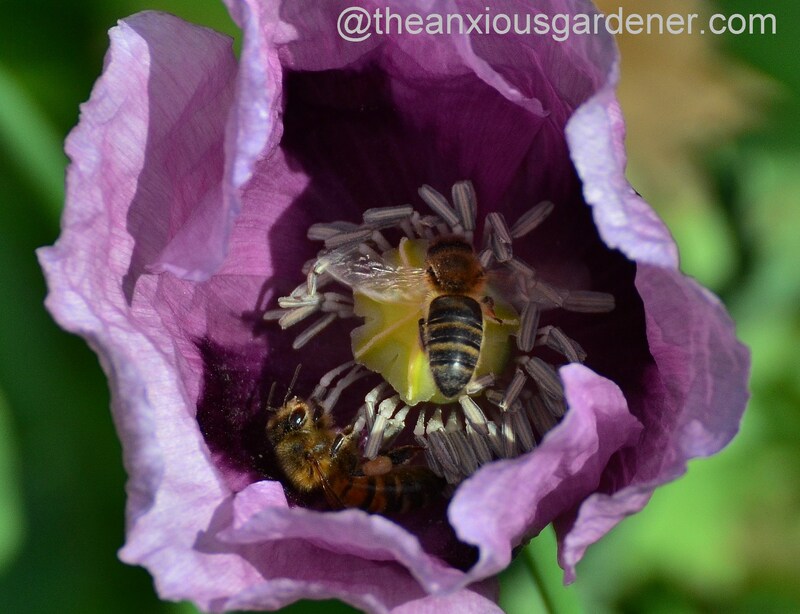 I’ve seen four or five honeybees crammed into one poppy. 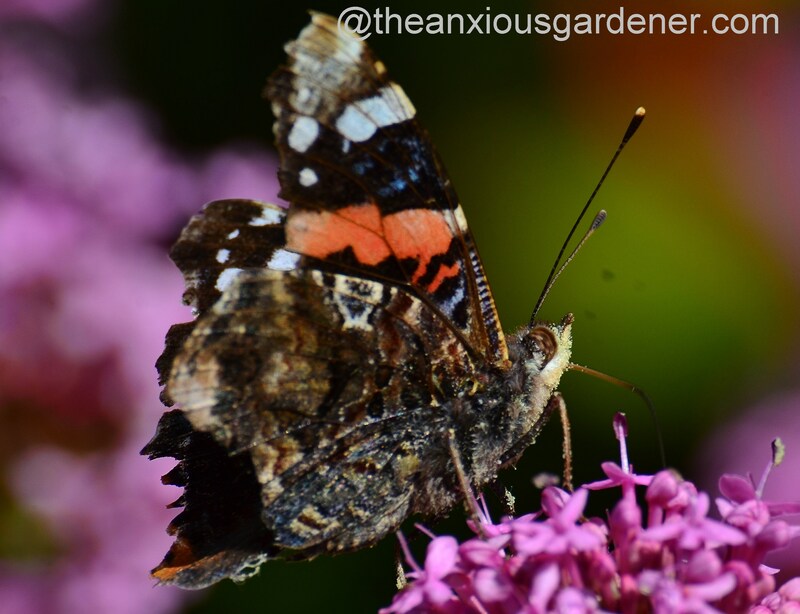 Butterflies, like this red admiral, love the valerian. But the icing on my Bakewell tart is the Hummingbird hawk-moth. I’ve seen them at the ‘Forge before feeding on lavender and V. bonariensis. But now I can watch them flitting about and supping on valerian too. I watered the plants (only once a week, obviously) whilst they got established but otherwise they fend for themselves. 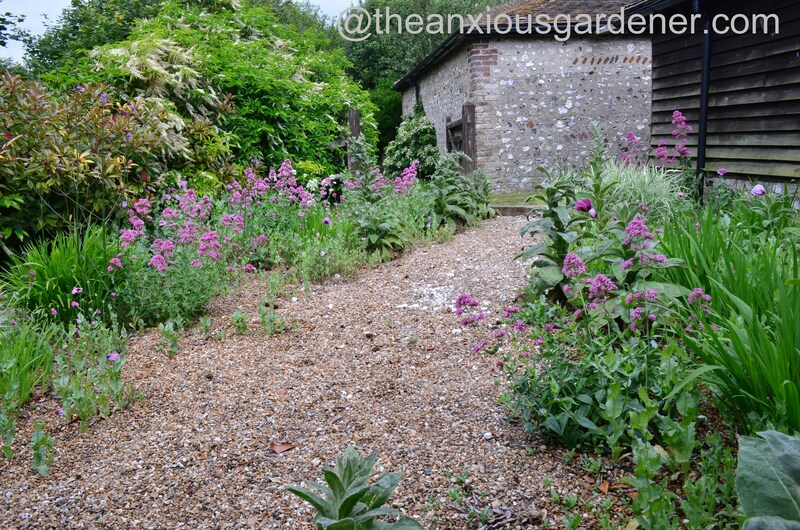 Below the three-inch deep gravel is very poor soil – mostly lumps of chalk actually. I do a little weeding and thinning; and pull up the poppies after they’ve seeded. It is still a little sparse but I have some ideas for more plants and something to fill the forthcoming ‘verbascum gaps.’ But I’ll only use stock or seed I already have or can scavenge. 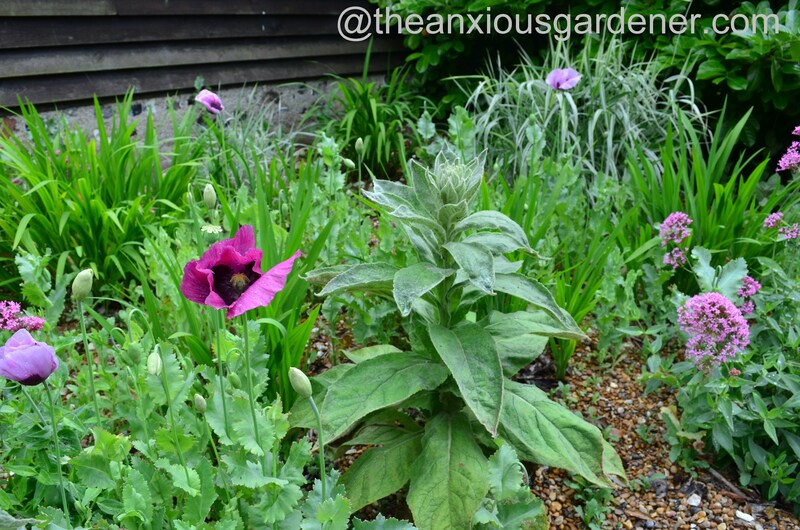 Because what I really like about my little gravel garden is … it didn’t cost a penny. Looks great! 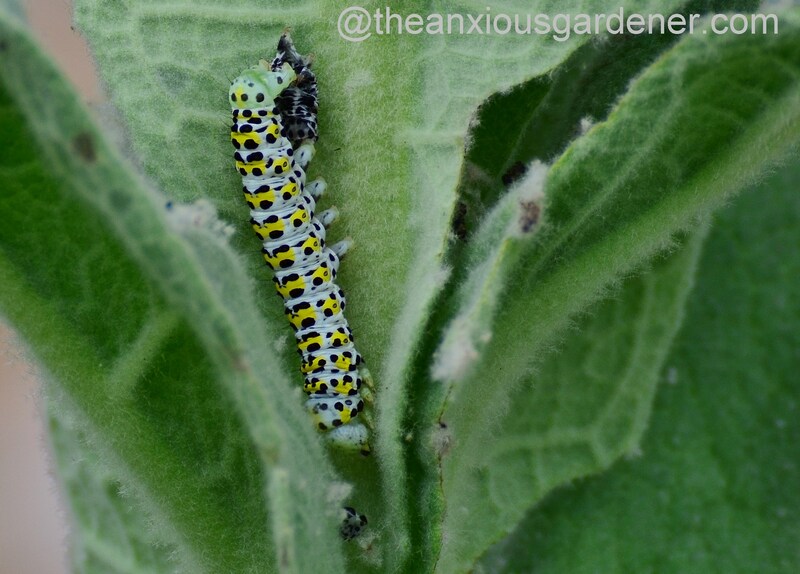 We have the same issue with my Verbascum chaixii album being shredded for the second year, so they’re coming out when I have the chance. I had one or two glorious years of Verbascums before those stripy blighters arrived and decimated them. Fortunately they don’t seem to have found my V.phoeniceum; I’ll be really sad if that is munched too! I fortunately don’t grow lilies because they’re poisonous to cats – and their pollen brings my husband out in huge allergies too – just as well or I’m sure that would be another critter to drive me to despair! Great to have discovered this excellent post and Intereting website. Gravel gardening the minimal way is a prime topic for me. Shame about the verbascum, for spires maybe try linaria, though they’d still be in the same colour spectrum. How about adding some grasses? Thought or not, it looks great! I have masses of Stipa gigantea seedlings, not sure where you are but, if you want some you’d be weclome to them. I love the hummingbird Hawk Moth shots! Thanks PL. You (more than anyone else!) might want to know that I used my 70-300 zoom lens – plenty of light and I could stand well back. would love know the reaction of your client? 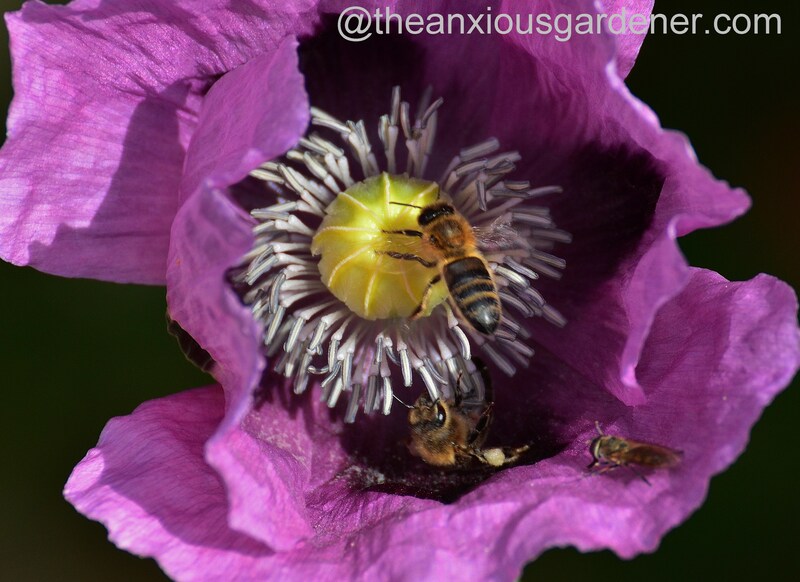 Our new garden has lots of hungry bees and I like to see that they enjoy poppies, as I’m spreading the inherited seedlings of Californian orange and Flanders red. I think your mystery grass looks like Variegated Ribbon Grass (Phalaris arundinacea var. Picta)… Also, really nice photos of the insects! It must be so rewarding to have made something beautiful from nothing. Hullo Emily, tick and gold star for you. Thank you for identifying my grass. I used to dislike variegated plants but I’m softening in old age. I really like the ribbon grass (if a little surprised it seems so happy in such harsh conditions). Dave. Lovely. This is the first I’ve seen a purple poppy. Welcome to the club! 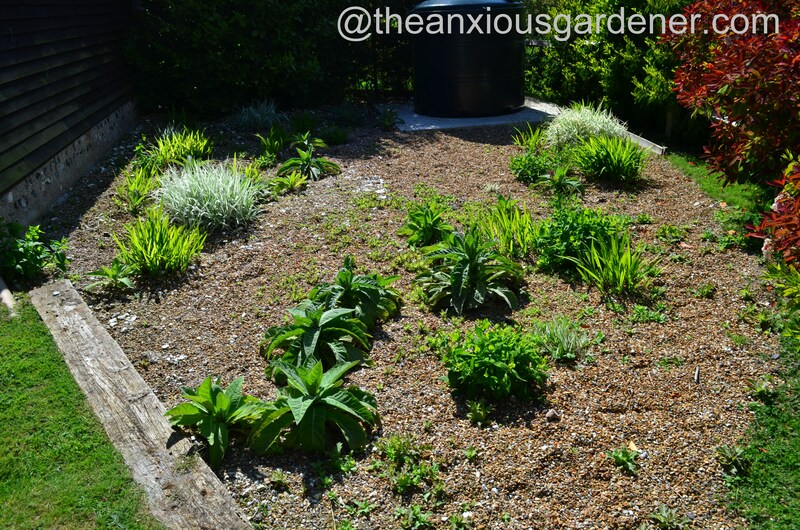 I have been preaching about the potential of gravel gardens for years and blog about them frequently. That’s really turned out rather well – are the owners pleased? 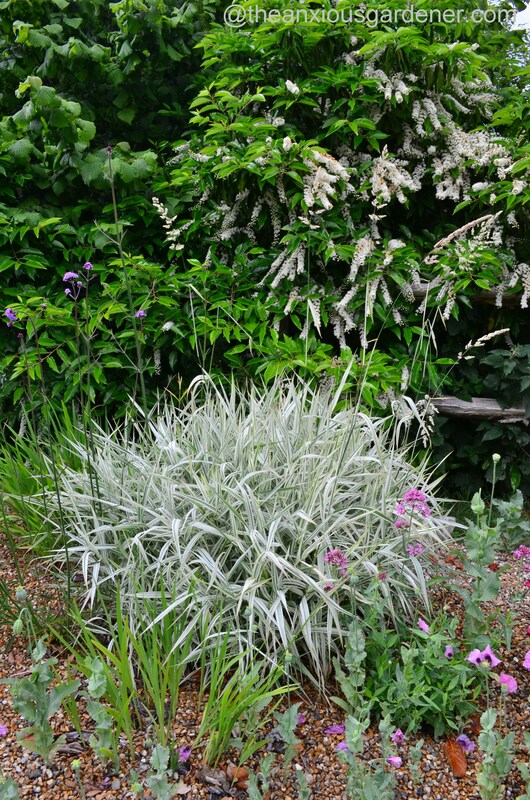 I wish you could tell us what that grass is – it’s too small for Arundo donax, too narrow for an Astelia, wrong colour for a Miscanthus. Any guesses to quash my curiosity? You have the magic touch. You are truly amazing. Bravo on your splendid new gravel bed ol’ fella. One assumes the Priory owners are delighted with their new FREE bed. If you can get hold of a romneya it will do splendidly in these conditions. Take root cuttings in February when plant is dormant, baby along until they are established. Ooo! I like the sound of those troughs. 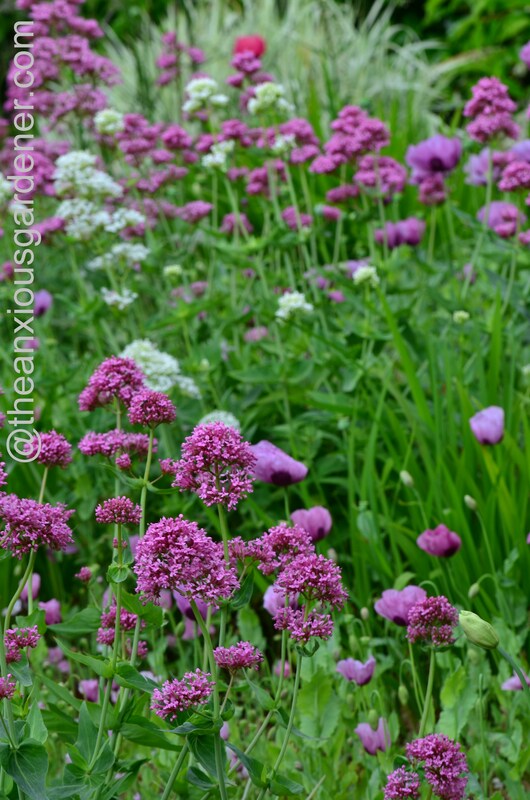 They’d look fabulous planted with Dianthus carthusianorum, Verbena rigida and Californian poopies. Sorry, I’m coveting your troughs! You are so resourceful and a great plants man. I enjoyed this blog tremendously. The gravel garden looks fantastic and I am sure the man filling the oil tank would be enjoying the sights as well on all of his visits. I agree with Rej. 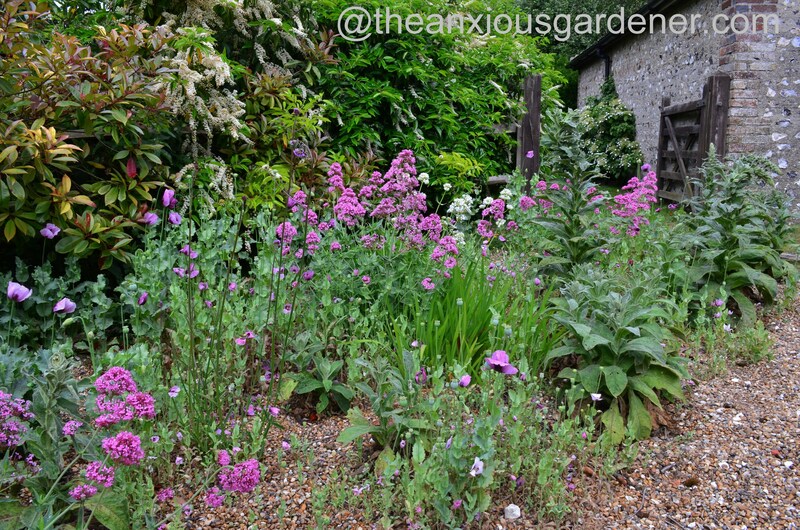 It is amazing what colour can be achieved in a gravel gardens. I love California poppies in them. Would Hollyhocks provide you with the statuesque plants you wish for? that hummingbird moth is just awesome !!! really looks like a bird ! I’ve never seen one in real life so far. Enjoyed this (and the pictures, too). It’s wonderful, Dave. Valerian is one of my favorite indestructible plants — still blooming here after a week of 100F weather (which is more than can be said of me). Would something like a yellow baptisia work in place of the mullein? What a great idea! I wonder if it would also work on larger stone mulches, such as bluestone chips? I’m looking forward to the crocosmia and verbena in bloom together, that will be a show! Hope it makes up for your verbascum troubles. The forge is starting to get interesting. Your shots of the hummingbird Hawk Moth are wonderful – I’ve seen a couple of these moths in my garden recently but couldn’t identify them – until now! Many thanks! Sue. 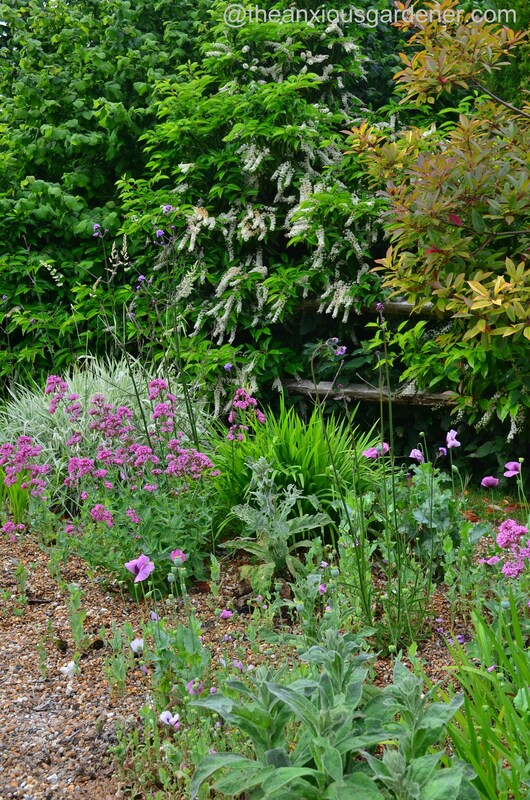 Great ideas for a gravel garden. I didn’t know you could grow so much without much soil. I have a very dry raised bed with poor soil round the side of the house. (Lots of tree roots from a neighbours hedge make it difficult to grow things) so I might pinch a few ideas. Only problem is your garden seems to be predominantly purple and my other half doesn’t like purple! Thanks for the ideas Dave, I am certainly thinking about creating some sort of dry garden, maybe with some large rocks and some slate chips. I think I will pass on the Crocosmia, though, as I had a very bad time digging some out last year – my fault as I had left it about 20 years! Thanks for following my blog,too – I hope you will enjoy some of my articles as much as I enjoy yours. They are a bit few and far between sometimes as we are away quite a lot, but I have a few ready to write. Fantastic work David! A testament to your skills to come up with this and not spent a single penny! Reblogged this on Pacey-Buck Garden Design. beautiful pictures of the hummingbird hawk moth! We’ve just bought a second home in Norfolk and I plan on making the small garden very low maintenance as we won’t be there all the time. You have given me some great ideas and I would be interested to learn what you replace the munched verbascum with?! Do you think all these plants would work just as well with small pebbles rather than gravel? Thank you once again for a wonderful blog! It’s always frustrating when asked by the customer to “remove” a perfectly good plant. This creation is a wonderful solution! You are showing commitment and vision for what clearly is a passion. Brilliant! Thank for this. Wonderful. Beth Chatto would be proud!